A small contingent of Liverpool Pembroke Sefton athletes were at Hull for the Northern Under 20 Championships and came away with a clutch of medals. 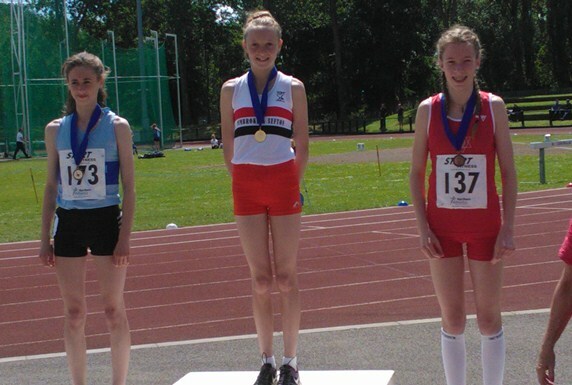 Under 15 Rosie Johnson demonstrated a maturity beyond her years in the 1500m. Up against two girls who on paper were faster she simply sat in and unleashed a blistering finish that left them gasping. Her time was a relatively modest 4.50.64 but the gold medal was visible proof of her talent and progress in recent years. Jai Vernon McGuigan was even more dominant in the U20 5000m lapping the entire field and coming home with a personal best time of 15.06.09. Further representative honours seem on their way. Earlier the same week at a graded meeting in Stretford Kirsty Longley ran a PB for the 3000m (10.09.76) with Chris Pedder just ahead on 10.07.68, a time that puts him in the top echelon of Veteran runners. Hayley Nenva, one of the Micronesia Olympic team squad currently training with LPS, recorded a very satisfactory 800m time of 2.15.83. But probably the best result of the evening came from Jonathan Bride who ran a 2.08.16 800m. If there was an award for the most improved LPS athlete Jonathan would surely take it. Rosie Johnson Northern U15 1500m Champion flanked by Philippa Stone (Middlesborough) and Harriet Knowles-Jones (Warrington).